Scotland's leading specialist holiday lettings agency, Cottages & Castles Ltd, has added Orkney to its portfolio of holiday accommodation for visitors to the islands. Cottages & Castles has been operating for over 25 years providing a dedicated holiday lets service offering a supreme range of self catering holiday cottages, exclusive large houses, holiday castles, mansions and sporting lodges for rent throughout Scotland, and now with a fantastic choice of properties available to let on Orkney. Rhona MacInnes, a local on Orkney has been appointed by Cottages and Castles to oversee this new and exciting market. Rhona has excellent knowledge of the islands as well as the tourism market having opened her own business servicing holiday houses on the islands. 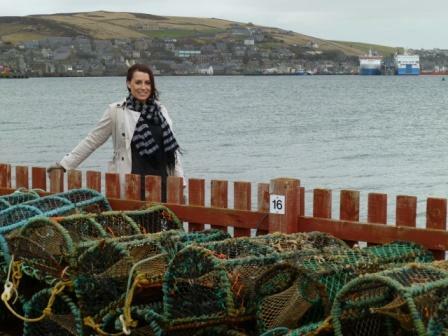 With a professional background in teaching and a well travelled year or two in Australia, Rhona has happily returned to Orkney to enjoy the peace and pleasures of her childhood. Rhona said: "The Orkney Islands are a beautiful part of Scotland with much to offer for a fantastic getaway however, are often overlooked by holidaymakers. We have experienced a lot of requests for accommodation on Orkney. It is very much an untapped market and we look forward to working with property owners and potential holiday makers to promote Orkney and increase visitor numbers to the islands. "When holidaying in Orkney you are never far from the coast, with many water sports on offer. Alternatively, while inland you can play a round of golf, cast your rod in one of Orkney's many lochs, or just explore the awe inspiring scenery on foot or by bike. Orkney really does offer something for everyone a truly perfect holiday destination." Most recent figures available, for 2009, indicated that around 70,000 people came to explore Orkney (source: VisitScotland.org). Cottages & Castles aims to increase visitors to the region from both abroad and from home with a range of holiday properties now available in some of the most stunning locations on Orkney including The Old Granary at Quoy. Orkney is an archipelago of around 70 islands lying ten miles north of the Scottish Mainland, from which it is separated by the turbulent Pentland Firth. The Islands are part of Scotland, but at the same time are very distinct, for while Scotland is conventionally split into the Gaelic Highlands and the English speaking Lowlands, the Northern Isles have a strong Norse heritage and a history and culture of their own - they only became part of Scotland in 1468. Orcadians are perhaps best thought of as somewhat reluctant Scots. The top five visitor attractions on Orkney in 2009 (accordingly to figures from VisitScotland.org) were; the St Magnus Cathedral, Kirkwall; the Italian Chapel, Lambholm; Skara Brae, Stromness; Skaill House, Sandwick; and the Orkney Museum, Kirkwall. Cottages & Castles has also launched a new website that will transform the way families and visitors book holidays to Scotland, including Orkney, by offering visitors a one stop shop' for all their queries about where to stay, what to do and what to see. Cottages & Castles new website provides unparalleled interactive search functions, offering a one stop shop' for all your holiday queries. To make it easy for users to find their ideal area and holiday, the website has split Scotland up into distinct regions including the Orkney Islands, with each into more localised areas with suggestions for activities, attractions, eating out and events in the area. To find your perfect holiday visit www.cottages-and-castles.co.uk.